This Business Professor Rates Strategy of the Dolphin as One of the Best Business Books of All Time! Lynch and Kordis were indeed more than "slightly ahead of their time" in their exploration of the need to change "the quality and quantity of our awareness of complexity and our skills and comfort level in working with it." The authors' insights are brilliant and so very relevant to the challenges most individuals and organizations faced through the nineties and still grapple with today: going for the elegant outcome; leveraging the wave; breaking set; being on purpose; seeing through the brain's 'time window'; releasing to a higher order; pushing the envelope; shifting in time. It's deep and intelligent, but not intellectual. It's a thoughtful blueprint and practical road map of useful insight. The original “Dolphin Strategy” theory and model—the one mentioned in speeches before the English House of Lords, at the Nobel Forum in Stockholm and in countless thinking skills growth and corporate training workshops around the world—was introduced in three books. However, the complete body of work is available in laser print versions. These 8 ½-inch-by-11-inch copies come in professionally designed and printed color covers and are bound in plastic- or wire-comb binders. See purchase details below under "The Dolphin Trilogy." (The “Triology” set also includes one copy of each of the three Brain Technologies assessment tools needed to complete all the exercises in the workbook.) Order the complete Trilogy Edition and receive a discount of more than 20% off the total retail price for the three books and three assessment tools! 1 laser print copy each of Strategy of the Dolphin®: Scoring a Win in a Chaotic World; DolphinThink, the workbook, plus 3 assessments (The BrainMap®, MindMaker6® and The mCircle® Instrument); and Your Dolphin High-Performance Business Brain, the book. Only a limited number of the original U.S. (William Morrow) and United Kingdom (Hutchinson Books) hardback versions of Strategy of the Dolphin®: Scoring a Win in a Chaotic World, remain in the stocks of Brain Technologies These mint-condition originals will be autographed by the lead author upon request and are available for $75 each, plus shipping/handling (limit one to a customer, please). No English-language editions by the original major publishing houses remain in print. Strategy of the Dolphin®: Scoring a Win in a Chaotic World has been published in a number of other languages. Brain Technologies has several copies of the following works available. Most are in soft cover and may have minor creasing or other minimal marks on the cover. The inside pages are “mint condition” mark- and crease-free. La Stratégie du Dauphin (ISBN 2-7619-1141-5), French, soft cover, by Les Éditions de l'Homme. DelphinStrategien (ISBN 3-9806363-1-3), German, hard cover, by Verlag Gerhard Henrich. Greek language edition, soft cover, by Livani Publishing Organization S.A.
Delfinstratégia, Hungarian, soft cover, by Agykontroll Kft. A Estratêgia do Golfinho, Portuguese, soft cover, by Editoria Cultrix. Yunuslarin Stratejisi, Turkish, by TÜRKIYE BANKASI. DelphinDenken: Gewinn mit Gehirn, German, hardcover, by Rudolf Haufe Verlag. Der Schlüssek zur Globalisierung: handbuch für den Wandel, German, hard cover, by Junfermann Verlag. The single-copy price for any of the above is $100 plus shipping. IMPORTANT! When checking out, please note in the space provided for comments which of the above titles you are ordering. Give your brain the information it needs, and you can be blown away by what it can figure out for you. And if that information is coming from the DolphinThink® Workbook and its supporting self assessments, well, that’s the best of all possible worlds to prepare you for where you need to go next. This powerful array of self-discovery methods takes key insights from the renowned dolphin strategy and enlists them to work in your behalf. These self-inquiry techniques and approaches have been highly praised for inspiring their readers to produce the new outcomes they need in a rapid-change world. How? By showing them how to discover and mobilize the totality that they are (how they organize themselves). And what to do with it next (how they respond to the complicated world around them). Uses 31 principles to look at who you are from an amazing variety of perspectives, some of which have probably never occurred to you. Helps you perform diagnostic "triage" on your current world-view aimed at ferreting out ways that your current beliefs may be sabotaging your change efforts. Helps you answer: What am I alive to do? And what’s my natural “edge” in terms of what the world needs most from me now? Guides you in creating a vision for the future and then tests this vision for realism and viability. Teaches the importance of getting you focused ruthlessly on "the critical 20%" of the activities, resources and initiatives best suited for getting you where you want to go. Helps you grow comfortable with the idea that you may need to make truly radical personal changes to get where you are aiming. Puts you through a crash course in recognizing obstacles that your mind may erect against change and coaches you on how to deal with these roadblocks. Guides you through the Breakthrough Thinking process for making radical discoveries and shifts in your life and career realities. Shows you a powerful alternative to traveling the Grief and Recovery Cycle when you let go of the past. Provides strategies and techniques for helping others make the changes they need to upgrade their own thinking skills. Double-checks your ability to use the Dolphin Strategy—to see the world through a world-view that is the most gifted so far at finding and mobilizing the next right, smart good thing. 122 pages. Two-color cover. Intensive paper-and-pencil exercises with work spaces for keeping track of your conclusions and decisions on nearly every page. 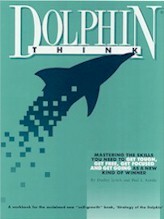 Its numerous graphics and illustrations frequently use metaphors based on DolphinThink's nautical theme. To complete all exercises in the DolphinThink Workbook, you also need one copy of each of these BTC instruments: The BrainMap, MindMaker6 and The mCircle Instrument. Get the workbook and all three instructions and save! I like the author's disciplined & yet artful blending of cognitive sciences, psychology, physics, sociology, & business strategy in his writings. On hindsight, I realised that many of his provocative ideas were far ahead of the mass market business reading material. I strongly recommend reading the author's brilliant thoughtwares, starting with Your Dolphin High Performance Business Brain. This work is truly more than 'world class'—it's in a class by itself: the most powerful book you will ever read. When initially published in the mid-1980s, Dudley Lynch's Your High-Performance Business Brain (out of print) was considered one of those rare, readable early-on books capable of forging connections between the burgeoning cognitive sciences and the practices of business. Many readers (including members of MacMillan's Business Book Club) perused its pages at about the same time they were taking their fledging steps into personal computing. Back then, most PCs were based either on Intel's 8088 or 80286 central processing chip. At best, their owners had a mere 29,000 transistors—switches—to play with. By the mid-1990s, Intel's best chips had more than three million transistors each. And with the arrival of each new computer generation since then, this number has grown explosively. With each new generation of chips, new ways to apply new knowledge of how the human "central processing unit"—the brain—works to the challenges of an emerging global business environment have appeared. In this extensive revision of his original work, Dudley again goes nautical. He ties his ideas on the business brain to his (and co-author Paul L. Kordis’s) writings and models on business and change—that is, to “the dolphin strategy,” as it has come to be known in many parts of the international business world. The outcome is a business book for the new century and the new millennium, with dozens of new graphics and charts, an inviting new "browse-able" format, and a wealth of new quotes and examples. It explains as never before the intimate, powerful connections between good business thinking and good business results. Soft Cover (plastic spiral binder). 257 pages.